All o fthe gifts shown in the picture above went to a member of our community who would have otherwise not recieved a gift. 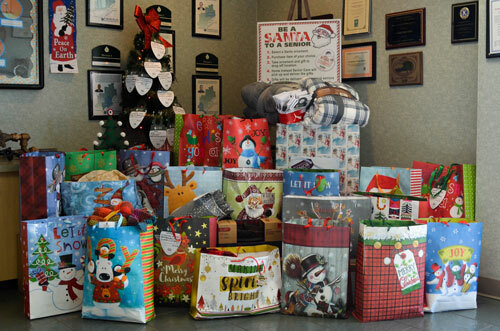 Thank you for your overwhelming support of the CHiPs for Kids and Be a Santa to a Senior holiday gift drives for the 2018 holiday season. With the support of the Carmichael Community, the holiday gift drives were a wonderful success and helped make a difference in the lives of both kids and seniors in need. All of the gifts shown in the picture above went to a member of our community who would have otherwise not received a gift. Thank you for your overwhelming support of the CHiPs for Kids and Be a Santa to a Senior holiday gift drives for the 2017 holiday season. With the support of the Carmichael Community, the holiday gift drives were a wonderful success and helped make a difference in the lives of both kids and seniors in need.